A South Korean court has sentenced former President Park Geun-hye to 24 years in prison for corruption. The Seoul Central District Court ruled Park guilty of bribery, extortion, abuse of power and other charges. The court's chief judge said the punishment was necessary to prevent similar wrongdoing by other presidents in the future. Along with the prison sentence, Park was fined more than $16 million. The former South Korean leader has one week to appeal the ruling. Park has continued to say she is innocent of any wrongdoing. She says she is a victim of politics. Government lawyers had demanded a 30-year prison term. Park was accused of working with her longtime friend Choi Soon-sil to force businesses to give $72 million to start two foundations. Choi controlled both organizations. The two women were also found guilty of taking bribes from some of those companies. 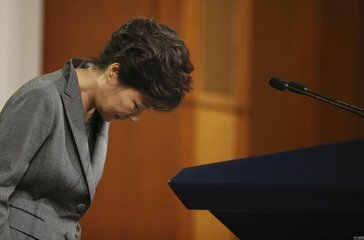 Park was removed from office early last year following months of protests. Millions marched calling for her ouster. She is a daughter of leader Park Chung-hee, who ruled South Korea for about 18 years until his death in 1979. The military and other opponents accuse Mr. Thaksin of corruption and abuse of power. Most are black and Hispanic men. Many are frisked, and nearly all are innocent of any crime, according to figures gathered by The Associated Press. What happens to a person's private opinion if he is forced to do or say something contrary to that opinion? Mr McKinnon is accused of serious crimes and the US has a lawful right to seek his extradition, as we do when we wish to prosecute people who break our laws. 5.Millions marched calling for her ouster. It's a situation that calls for a blend of delicacy and force. They angrily called for Robinson's resignation. 6.The court's chief judge said the punishment was necessary to prevent similar wrongdoing by other presidents in the future. In the future, robots will supersede human beings for very heavy work. I have high hopes for what the initiative – and all of us – can do together in the future.